Are you an organized person? Is everything at your fingertips? If so, good for you. I, unfortunately, am a bit more unorganized and can spend quite a bit of time looking for a specific Excel file. I have found that adding keywords to a file when I create it, can help me locate it later if I don’t remember the name file. It is very easy to do. Click on File and then select Info. Click the Properties drop-down arrow – located over on the far right side of the screen and then select Advanced Properties. Click on the Summary Tab if necessary and enter keywords that relate to the file. Click OK.
To search, simply go to the Windows Explorer window and in the search box, located on the far right of the window, type in one of your keywords. Your file should display. You can also search on author and title as well. 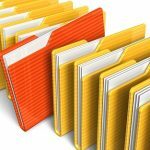 Lots of options to find your file. 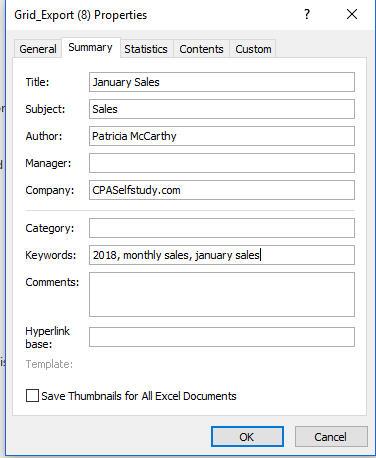 Hidden on the Home ribbon in Microsoft Excel, within the Find & Select Button, is an Excel feature that has some very special and generally unknown uses for the CPA. The feature is Go To Special. It’s the fourth option on the list when the Find & Select button is clicked. Have you ever had a couple of columns of data that you wanted to combine into one column? What do you do when there are blank spaces in some of the columns of data? Many will cut and paste the data from one column to the other, then manually delete the rows containing blanks. This begs the question; Is there an easier way? 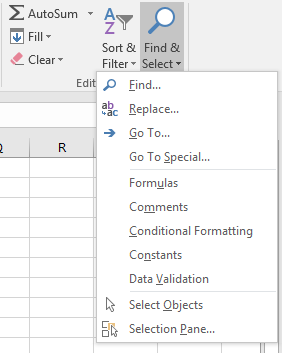 One way is to use the GoTo Special feature in Excel. This feature is located in the Home menu, under Find & Select on the far right hand side of the toolbar. Let’s copy only the cells that are not blank from B1:B7 to column A, under A7. Click Find & Select and choose GoTo Special. 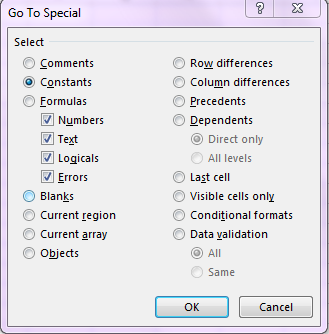 Select the radio button next to Constants and press OK.
Notice how only the cells with data are now shaded. Hover over any of the three shaded cells and right click. Select Copy. Then, select A8, right click and select Paste. 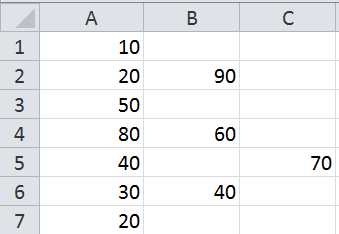 Only the non-blank cells are now pasted into column A. This technique can save quite a bit of time if you’re working with a large amount of data that requires manipulation into one column. It also works with any data that needs to be moved and contains unneeded blanks.